You should have written an initial Problem Statement at the end of the Initial Impressions module. Hopefully you have been referring back to it during the last two modules but, if not, it is time to review it now – we told you innovation was iterative! 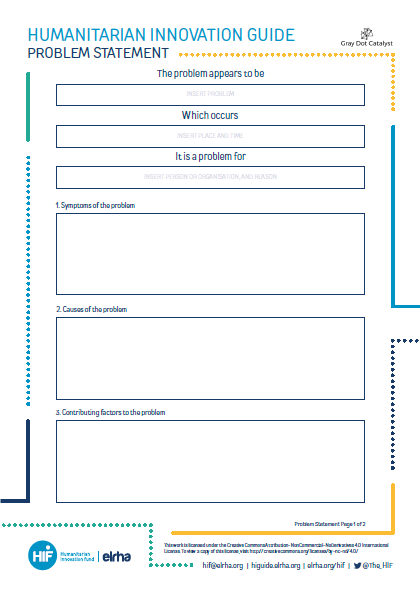 In your project team review each aspect of the Problem Statement as it stands: how you have articulated and framed the problem, where it occurs, and who it affects. Discuss and decide on any changes that are required, based on the information gathering and analysis you have done. Although by this point you will have given the issues at hand much consideration, your articulation of the problem will still be tentative. You have not carried out exhaustive research, and you will still have some assumptions. Such is the ‘messy’ exploratory nature of innovation. You will also need to incorporate information from the previous module, regarding the symptoms, causes, contributing factors, importance and parameters of the problem space.